Chisinau - Several dozens of people took part in an anti-Semitic manifestation in central Chisinau on Sunday. The participants of the protest, which took place in Chisinau’s central park, chanted anti-Semitic slogans. They ripped the Jewish symbols put up in the park last Friday on the occasion of the Jewish Hanukkah holiday. 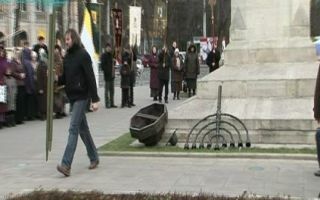 The traditional Jewish candlestick was knocked down from the plinth and thrown to the pedestal of the monument to Moldovan ruler Stefan Cel Mare. The rally which lasted almost one hour also involved several people dressed as priests. Police did not interfere, though several patrols were keeping an eye on what happened. Officers from the Chisinau police commissariat arrived together with representatives from the Israeli Embassy later when the manifestation was already over. Activists from the Chisinau Jewish community were here last Friday to put up the Jewish symbols in the central park on the occasion of the Hanukkah festivities. The symbols were expected to remain their throughout the eight-day holiday period, they said. For those who'll cry anti-semitism, I'll say that it's everyone right to express their likes or dislikes towards religions. And we liberals call this freedom of religion! What ever the case is those who tore down a monument is violating civil law and should be jailed!!! Why instigate antisemitism by putting menorah's in these public places??? Does anyone know what the chazer with the microphone is saying? For that matter, does anyone know what the rest of these dogs are singing about? dislike of the jewish religion IS antisemitism. please dont represent your views as those of liberals. You are a very naive person to think that there is no anti semitism here. maybe, we shouldnt go with a yarmulka because we will instigate them? where is your Gaon Yaacov? Its almost as if the comments here are defending this behaviour but attacking the ones who put up the menorahs!! Its redicioulous!!! Chabad is killing our reputation!! Chazal told us where and how to light the menorah!! Not in parks and city halls!! All this does is fuel the flames of antisemitism. I am ashamed that every year, around this time, all the headlines are filled with some menorah story or another. There are always lawsuits and the like. Is this Chabad's idea of Parsumei Nisah? Don't they realize we are in galus and must act in that way. Memorahs should be lit in our homes with our families, not in the public by some goyishe governor!! All that Chabad is trying to do is copy the Christians. Whatever they do with their trees, Chabad does with the menorah!! So when are they going to come out with a "Moshiach-clause"?!? This is getting out of hand. They have become way too similar to the Christians in too many ways!! OD MOSAY!! #2 I agree with you. That's exactly what the liberals are. They are thugs in the name of liberty. If you want to express your religion you can protest as much as you want but you can't throw down the other free persons menorah. What kind of one sided freedom is that? All you liberals should be dumped in jail. Before everyone attacks Chabad, this does not appear to be a Chabad menorah, it looks like the menorahs put up by Holocaust memorials all over eastern Europe. While I too question the wisdom of placing menorahs, etc. in public non-Jewish places, one thing is for sure: Moldovans aren't ready yet for liberty's blessings. You think your so safe in Brooklyn? HalAcha in shulchan aruch is clear thAt in times of golus you lght INSIDE these good intention Jews are causing much more harm and very little good. Wow. If anyone in the world cared what Moldovans thought, that would be really offensive. We should also close down all our Shuls and schools and yeshivos. No doubt their presence antagonises the anti-semites more than any menorah can. “ Chabad is killing our reputation!! Where in this article did you see any mention of Chabad? Chabad started this and continues to do this with the guidance of their Rebbe. You have no idea how many Yiddishe neshumos are sparked by these public lightings. It's worth a little anti semitism. There are countless areas of halachah where certain actions are discouraged or encouraged "meeshum aivah" (lit. due to hatred of Jews). Now along comes Chabad and ignores this vital concept on a yearly basis by placing large menorahs in the center of anti-semitic areas. I really don't understand why they think they are smarter than chazal in this regard. While we are supposed to live and act like frum yidden, there is no basis or need to provoke the goyim to think that "the Jews are trying to take control." We are in golus, it would do us well to remember that and to keep it in mind on a daily basis. it is "ish ubeiso" for the home not the public thoroughfare. No need to show off and toot our horn saying Hey you goyim "WE ARE HERE LOOOK WE ARE HERE"
It is infantile and causes much needless animosity. We need to adopt a "Hatznei leches" outlook and we'll be a lot better off. Unfortunatley, because of these misguided naive jews that try to imitate the public christmas trees & displays, the rest of us that want no part of this we have to suffer the consequences. for kiruv etc. That is a load of crock - don't be smarter than the shulchan oruch & chazal. Just put it in your widow follow the halacha - don't oiber chachomim. By the way I'm all for kiruv but not by distorting a mitzva and agravating the goyim. Almost 102 years ago, my family fled that city to escape the pogroms. One of my ancestors was a Rav there in fact. For all I know I might still have relatives there. I thank Chabad for reaching out to them. And for reaching out to all Jews everywhere, as we are all one family. i always say....we as a nation suffered more from the cross than from the arabs. this just goes to show you in a country where there are almost no Jews they still can't stand us. you are no liberal you are either sarcastic trying to make fun of liberals or an idiot. its funny that your kneejerk hatred of Chabad is so great you dont even notice that the Menorah is NOT a Chabad Menorah. But Way to display senseless hatred just in time for Chanukah Im sure your Making Hashem very proud. I don't know what the big stink is about, looks like they took care not to harm the menorah. watch the video they seem somewhat gentle with it. I don't know why they were moving it..just a bunch of backward eastern europeans, old fools.. they are really to be pitied for their ignorance and backwardness. unfortunately, the next step from backward and ignorant is the old standard blame and kill jews. I'm not shocked at all. They have a huge reputation of anti-semitism. A hundred years ago it was killing our ancestors in bloody progroms, and today its more of a 'limited' way of expressing their hatred towards us. Let's make peace with the fact. There's a pusik that says 'eisuv soinah l'yakov'. We won't be able to change their views or minds. They will always hate us for its root is jealousy simply because we are the CHOSEN nation. Let's be PROUD with it!! You are no liberal because you claim to be, I think you are a troll, liberal don’t condom this behavior it’s against religious freedom and for sure anti-Semitic. Chabad rocks!!! Be proud you’re Jewish!!! We, Chabad, are not afraid of what the world thinks. This is G-D’s world! - The G-D of the Jews! Look at the first Rashi in Chumash! Are you one of those who afraid to wear your kipa in public too or don’t grow a beard so you can look like a goy!!! Looks like a bunch unemployed bored people trying to do something with their time. May God protect us all over the world, no one likes us. “ Chabad started this and continues to do this with the guidance of their Rebbe. No it is not worth because innocent Yidden will suffer. The Rebbe was a godol but I don't believe he ordered lightning a menorah in Kishinev. Initiating antisemitism is never good.Maybe you like a "little anitisemitism" but normal Yiidden don't need it. these idiot peasants don't realize that without the Maccabean Jews fighting for the survival of Judaism, they would still be in the woods roasting dogs for dinner and worshipping trees. Although I always defend right wing Judaism practices, I agree with you on this matter 100%. Parsumay Nissa is for US to see not the gentiles. This is basiclly a copy of their practices. With all due respect, nowhere does it say it was Chabad in the article, and if it was Chabad, it would say it. It sayd that the Menorah was put up by the Jewish Comunity of Moldova. Oh, and by the way, do you know how many people have become frum from seeing a public Menorah in a Public place. “ Chabad rocks!!! Be proud you’re Jewish!!! We, Chabad, are not afraid of what the world thinks. This is G-D’s world! - The G-D of the Jews! Look at the first Rashi in Chumash! Which G-d are you talking about? See Post #20 "Chabad started this and continues to do this with the guidance of their Rebbe"
Continues to do this with his guidance? HUH? Maybe that is why they are so misguided!! Ok ok now I agree, that's it! I can't this anti semitism anymore, we, in the USA, especially those unfortunate Jews who live outside large metropolitin areas with heavy Jewish population need to start keeping a low profile. All that stuff about wearing a yarmulke in the military and workplace is out. We neeed to start insisting that our kids stop wearing any identifiable jewish symbols, like in France, no yamulke or tzitzis outside, take off all idntifying marks of schools and shuls and restaurants like all over Europe, stop being so out in front of the Goyim. Now I get it. Ok guys spread the word. BTW, tha Am Haaretz who keeps on Hocking about takonas ChaZaL re sakonoh and "aivah" needs to start learning and understanding what sakona is, see rashi there about the "chaborim"
Guys, bottom line is, we need to go back deeper into golus cus guess what?? I got news for you, there are goyim that hate us. So let's do what yidden did all thru history and run!!!!! Coming from a non-Chabad viewpoint I find it very troubling that all you guys quoting some mamar chazal or whatever to prove your point that we should be hatzne leches mishum Aivah etc etc but denigrate your own Chazal when you disrespect Chabadniks for following their Rebbe as Chazal clearly instruct us as is a D'oraisa as well 'Lo Sasur' so how do you have such chutzpa and just downright indecency to talk like the way you do? If you have an issue with the public Menorahs take it up with their Rebbe but I think the Rebbe knew how to learn those areas in Shas about Aiva and the inyan pirsumi nisa better than you and your teachers which I don't have high regard for anyway of they produced such a michutzof as you. 1) This menoiro is (almost) certainly non-Chabad. The Rebbe is very much against this shape of the menoiro and there was a sharp sicha on this. This shape is borrowed from the Titus y''sh Arc in Rome and the the Rebbe warned that it represents subjugation of Jews to goyim, and other things R''L. If you watch the video you will see the goyim parading this menoiro exactly like on that infamous relief on titus arc. 2) Now, Chabad is not copying the notzrim - but you are. You definitely share their ideology - don't you, there should be no menoiros. Now, the mitzvah of kratzmach tree is davka on the inside - there is a Rashi on this - look it up. They chop off the tree, schlep it davka *into their house* and put shapes of sun, moon and stars on it - then I think they sacrifice rodents to it, not sure - very lebedik. We on the other hand, light menoiros davka *outside*. Does a zebra change it's stripes. I am glad that they do not hide their true feelings. No need to show off and toot our horn saying Hey you goyim "WE ARE HERE LOOOK WE ARE HERE"
please this is nuts, if one hold the above to be true then one should not wear a stremeil and dress like everyone else. Since we do not do that what is a menorah in public different. “ With all due respect, nowhere does it say it was Chabad in the article, and if it was Chabad, it would say it. It sayd that the Menorah was put up by the Jewish Comunity of Moldova. No,why don't you tell us exactly how many? "If I have an issue with their menorah take it up with their Rebbeh"???!!? Their Rebbeh is no longer with us--thats exactly the point--nothing can be taken up with him. Its pathetic how misguided chabtzkehs continue to do things in the name of the Rebbeh when the Rebbeh has been gone for 15 years and would likeky even object to these types of events!! Are you NUTS? If this isn't ANTI-SEMITISM what is it? Freedom of religion does NOT include the destruction of another religions symbols. In America, you're free to express your dislike as much as you want, BUT without destroying any public or private displays. The destruction of religious symbols or the painting of swastikas is considered a HATE crime. The fact that the police stood by and did nothing is also a crime. OK. Now we arrived at the end of the road, chevre. This chuchem here says that he knows better what the Rebbe wants of us than people who learn his sichos, ma'amarim, who live Chassidus, daven b'kovono, who are moiser nefesh on the Rebbe's shlichus. See, they are pathetic and misguided.. And the individual whose only accomplishment in life has been beating the world record for not moving out of his parents basement the longest is not... I don't know how many menoiros we have to put up in order to chase the choishech out if this kop. interesting, and at the same time their burning incense to and worshipping a dead Jew, what idiots. Moldova? Hey! That's a real powerhouse of a country. Our problem is not the Goyim. We will overcome the anti-Semites, if not sooner then later. Our problem is with pathetic Jews who have a knee-jerk reaction to anti-semitism; that instead of faulting the anti-semites, they turn around and blame Jews. This is the typical mindset of the GOLUS jew, and what has kept us in Golus for 2,000 years: sinas chinom and groveling before the goy. When a Jew is beaten, they say, we should not have walked on this street, not gone with the yarmulke, not announced our Jewishness, maybe then, they won't hate us. Jews in pre-war Europe also believed, if we cooperate, if we wont get them mad, they'll spare us, they wont kill us, they wont hate us that much. Good grief, hasn't 2000 years of groveling and blaming ourselves, of Jew- on- Jew finger -pointing taught us anything? Genug Shoin!!! Time for a little gaon Yaacov. Lets proudly state who we are and why we are. Chanukah calls for PIRSUMEI NISA, in other words, Chanukah DISPLAYS AND CHANUKAH PR. Time to get off the knees and start dancing and celebrating and rejoicing in our Yiddishkeit. Happiness is catchy. The story said that the Priests were Russian East Orthodox, not Roman Catholic. The Pope is trying to unify the East Orthodox with Rome based on news reports I have read in the news. Perhaps some macher with ties to East Orthodox should make an appeal for tolerance? It's worth a try to help dilute hatred. “ Moldova? Hey! That's a real powerhouse of a country. I agree with you 100% (not that it really matters). where the heck is moldova anyways?? and if their small action of dismantling a large piece of metal is strong enough to ignite such machlokes among brothers and sisters, then what do we have?? The menorah reminds us of the Bais Hamikdash, which should remind us that it was destroyed. And everyone knows why it was destroyed. yes, sinas chinam= baseless hatred which is what everyone arguing on this article is guilty of. IF WE DONT HAVE AHAVAS YISROEL, THEN WHAT DO WE HAVE?? The only way our galus is going to have a chance of ending is if we forget our puny differences and act like brothers and sisters who are children of the same father. Well actually what Chabad is trying to do is light the fire of the pintele yid who forgot or forgets that they are Jewish and bring them back to yiddishkeit. By lighting the Menorah in public places it reminds the freih Yiddin that see it, that they are Jewish and they should have pride in that, they should remember that and maybe check into it. Oy, where are the Israelis when you need them? What a beautiful monorah it was, What a shame! The majority of East Orthodox Moldovans are extremely primitive, It is very easy to manipulate them. I am sure that probably some idiot priest or not priest told them that Jews try to supress their religion and dominate the country. It was it. Tolerance is something that is way beyond understanding of the vast majority in this country since the most basic principals of civilization are unknown to these people. 99% of them think that Christ was Russian. Anti semitism is there but it is also complete darkness in their heads as well. chabad lights these menorahs, not for the goyim, but for those many yidden who are unfortunately, lost among the goyim. These lights have BH lit the neshamos of many yidden, and sparked their connection with Hashem, as it reminded them of their heritage. Yidden!! Be proud of your Jewishness! Being ashamed of it is your own self-created Golus. and defending these anti-semites is displaying your subjugation to them. Chabad's work is admirable, may they continue stronger than ever, wth the Rebbe's kochos. Who's burning incense over here? “ No need to show off and toot our horn saying Hey you goyim "WE ARE HERE LOOOK WE ARE HERE"
How we personally dress is personal and not meant for SHOW as oposed to a MENORAH davkah lit on a public street FOR THE PUBLIC ie for the benefit of Mr. GOY on his turf - and even more so those bizarre menorahs on top cars (I think it's those are bizayon to the whole concept of kedushas menora to go parading them around like a Dominoes Pizza ads in mekomoms metunofos) . these are PUBLIC DISPLAYS in the PUBLIC. and therefore it is showing off and tooting our horn saying Hey you goyim "WE ARE HERE LOOOK !!!! WE ARE HERE!!!!!" How we dress is nobody's business - but in Anti semetic countries and areas where shteimels and yarmulkas and taleisim outdoors will draw the ire and hatred of the populace it may be a good idea to just wear a cap outdoors. This has nothing to do with being yellow etc. it's just plain simple common sense. I wish all those macho red blooded yankee hot shots that are feeling their oats and advocate being tough and DAVKAH "showing off our yidishikeit" would have some rachmonus on their level headed brethren that are thinking with their heads. I hope that I have made a clear simple distinction between Menorahs in public and what one chooses to wear. All you've shown is that you're a complete am ho'oretz, who can't even translate a simple braisa. If you think "ner ish uveiso" has anything to do with where to light, then you should keep your mouth shut when your betters talk in learning. You are obviously ignorant of the gemoro, which says pirsumei nisso is for the Tarmudo'i, not for us. “ How we personally dress is personal and not meant for SHOW as oposed to a MENORAH davkah lit on a public street FOR THE PUBLIC ie for the benefit of Mr. GOY on his turf - and even more so those bizarre menorahs on top cars (I think it's those are bizayon to the whole concept of kedushas menora to go parading them around like a Dominoes Pizza ads in mekomoms metunofos) . these are PUBLIC DISPLAYS in the PUBLIC. and therefore it is showing off and tooting our horn saying Hey you goyim "WE ARE HERE LOOOK !!!! WE ARE HERE!!!!!" It IS showing off, but it is pikuach nefesh and needed to get our sanity back. We cannot exist in this mentality of bowing to the goyim, it was never proper, it was only necessary for pikuach nefesh then but no longer. Now when I walk by an Xmas tree, I am happy that Jews all over the world are, instead of just feeling lonely and pathetic, can instead look to the menorah that Chabad or whoever has put up and be proud of being a Jew instead of Ashamed and fearful that people will do something to them. Yashar Koach! The point could not have been made any better. What's wrong with you - you think that by not imitating the goyim with their public displays of Xmas trees etc. "you just feel lonely and pathetic" -- I think you need to see a shrink and work on your self esteem. B'h we can all be proud of who & what we are as observant jews without silly infantile uncalled for public displays. The proper way for kiruv is to seek out lost yidden wherever they are and try to be mekarev them and THEM only!!! Ohr Someach and many other outreach programs especially on College campuses are doing a fantastic job at this. I also admire those shluchim of Chabad that go to far flung desolate (of yiddishkeit) places and start going through the phone book for JEWISH names and have thus brought many of our lost brethren back -Kol Hakovod!!!. However, the public menorah business (by Chabadniks and others of limited torah knowledge) is a shtus and even leads to Chillul Hashem & hatred in many cases and does far more harm than good. I know that they nebech mean well ... The road to g----m is paved with good intentions -- a little seichel goes a long way. U'beso means family ie. that it's a "house"hold matter. and therefore needs to be lit in one's home either by the door or window or table as spelled out in the gemarah & shulcahn oruch ayin shom. I'm sure you will agree with that. Now you show me a mekor in shulchan oruch that mandates or even encourages an outdoor menorah in a public domain. I am almost positive that were one to make a bracha on such a public menorah it would surely be a bracha l'vatala (even if it were in a place of kulo yehudim and therfore no chilul hashem & antisemitism issue). “ Which G-d are you talking about? You speak as if you are from the states......which state, may I ask, are you from that you walk past a tree, get ashamed and feel lonely and fearful? If those are your FEELINGS, that is your own problem and has nothing to do with being around an Xmas tree. Dont blame the tree for how YOU feel, and where are you that you actually feel FEARFUL? Sounds a little dramatic to me. “ What's wrong with you - you think that by not imitating the goyim with their public displays of Xmas trees etc. "you just feel lonely and pathetic" -- I think you need to see a shrink and work on your self esteem. B'h we can all be proud of who & what we are as observant jews without silly infantile uncalled for public displays. The proper way for kiruv is to seek out lost yidden wherever they are and try to be mekarev them and THEM only!!! Ohr Someach and many other outreach programs especially on College campuses are doing a fantastic job at this. I also admire those shluchim of Chabad that go to far flung desolate (of yiddishkeit) places and start going through the phone book for JEWISH names and have thus brought many of our lost brethren back -Kol Hakovod!!!. However, the public menorah business (by Chabadniks and others of limited torah knowledge) is a shtus and even leads to Chillul Hashem & hatred in many cases and does far more harm than good. I know that they nebech mean well ... The road to g----m is paved with good intentions -- a little seichel goes a long way. I can't believe that you don't see a difference between lighting in YOUR PRIVATE home versus lighting in Times Square. There are none so blind as those that don't want to see!!! you maybe surprised at what he says in this regard. “ I can't believe that you don't see a difference between lighting in YOUR PRIVATE home versus lighting in Times Square. There are none so blind as those that don't want to see!!! I said Chabad "& those with limited torah knowledge"
torah prowess as a tool to promote their agenda. Many maybe most by and large teach mainly Tanya and have limited knowledge otherwise, again, they are all focused and driven with an agenda. Their agenda includes menorahs, moshiach, and Rebbe worship in various (sometimes alarming) degress some of which border on apikursos. This is the problem when you have a super supreme leader that towers way above all his minyons and cannot be replaced by anyone even close and he leaves no instructions for after his demise. His teachings become destorted and his directives are frozen in time and may or may not apply in all times and places -- He is not around to give an opinion. In short it is a cult. Chabad still does mostly wonderful work in kiruv although the kiruv is to their brand of judaism. But who am I to complain or critisize when I am not doing too much for kiruv aside from occasionally donating to kiruv orgs & trying to make a kiddush Hashem by my behavior as best i can. The Rebbe z'l was truly one of the most outstanding jewish leaders of all time. don't show that ha! look we can do that too. I hope you see my point. and am sorry if I was not clear. and it should be discernibly attributable to your HOUSEhold. as oposed to the middle of Grand Central Station lit by a cherry picker on TV. That is just showing off and tooting our horn. Before we know we will see lit up effigy's of Matiyahu and dreidels on peoples lawns and in the malls. We are getting closer by displaying large Pictures of the Rebbe waving or whatever on cars and homes with "Yechi etc." It is the opposite of hatznei leches and in my opinion immature behaviour by ignorant "desperate for attention" yidden. Zolen zei zayn gezunt !!! And you're still spouting amhoratzus. "Ner ish uveiso" is not the ideal, it is the MINIMUM. It has nothing to do with where to light; it's about how many to light, and the minimum is one light for an entire family. But WHERE do they light that one lamp? Outside, where the Tarmudo'im can see it. As for a mokor, why do we light the menorah in shul? For one reason only: because it is a place of public assembly, where the nes can be publicized. And we make a brocho on it. The public menoros are no different, and far greater talmidei chachomim than you have already paskened that they must be lit with brochos. I don't recall him publishing anything, and certainly not a sefer on halachah. You aren't going to repeat the myth of him being a highly trained engineer are you? “ And you're still spouting amhoratzus. "Ner ish uveiso" is not the ideal, it is the MINIMUM. It has nothing to do with where to light; it's about how many to light, and the minimum is one light for an entire family. But WHERE do they light that one lamp? Outside, where the Tarmudo'im can see it. If I recall correctly the reason we light in shul is because until recently there were r"l many people who did not have a house in which to light and they would be yotzai to some degree with the lighting in shul. It was also for homeless Jews that the halachah was made that when one sees chanukah licht and will not be lighting for oneself one says the brachah of sh'osah nissim. Carefull who your talking and how your talking to here. The Gemorah is talking about Tarmudo'i, which refers to lighting outside your home or the opinion of lighting inside. Not in Places like Times Square next to a pine tree in a public square. The question is where is a Jew to light HIS OWN Menorah. There is no mitzvah to light a menorah for goyim. That's a new invention by Chabad. Aside from the simple fact that Lubavitcher Rebbe probably knew a million times more than you in all chelkei hatorah, I would venture the "Pirsumei nisah" of menorahs on television, menorhs in lawsuits, and menorahs in anti-semitic countries being torn down, inspires in no small measure the soul of the completely assimilated Jew who cries out "THEY CAN'T DO THAT TO US ANYMORE"! and makes up his mind that he going to light a bogger an better menorah next year. My humble opinion, but having personally known people who's first encounter with Yiddishkeit was that they came up to ask questions at a large public menorah lighting and are now yera'im vishlaymim, I for one would not second guess the Lubavitcher Rebbe z"l.
“ Carefull who your talking and how your talking to here. The Gemorah is talking about Tarmudo'i, which refers to lighting outside your home or the opinion of lighting inside. Not in Places like Times Square next to a pine tree in a public square. The question is where is a Jew to light HIS OWN Menorah. There is no mitzvah to light a menorah for goyim. That's a new invention by Chabad. It certainly seems from these strange Chabad minhagim that Chabad has it's own brand of judaism. I really think they mean well but are ignorant of bonafide halacha. will readily see through the bluff. Nuff said. “ I said Chabad "& those with limited torah knowledge"
FYI the Rosh Kolel in Lubavitch and Rav on the Crown Heights Beis Din, Harav Yosef Avrohom Halevi Heller Shlita says (Heoros Ubiurim) that based on the reasons given by the Beis Yosef (aside from zecher lmikdash) for lighting in the Beis Hakneses namely because there is more pirsuma nisa and to be motzi the aino boki, these reasons are not limited to beis hakneses davka and beis kakneses was only chosen because that's where the rabim is found but equally applies to wherever the tzibur congregates as the ikar is the pirsum "BARABIM" and to be motzi the eino boki and the takana of the Rebbe "hein hein divrei haKolbo". Rav Heller also brings the Ritva (Shabbos 23a) "V'nahagu l'hadlik bibatei knesiyos kdei laasos pirumi nisa b'makom harabim" and Rav Heller writes: "Umivuar b'hadya d'ikar takanas hahadlaka hi bimkom harabim upashut shebizmanim haheim makom harabim haragil haya b'beis hakneses ulam ikar takanas hahadlaka hu l'pirsumi nisa bimkom harabim, v'einah shayeches l'beis hakneses yoseir mikal makom tziburi". Rav Heller then discusses the idea of lighting in the street with only goyim and brings from Shilti Giborim & Hisorirus Hatshuva (chelek 1 153) who hold that there is pirsumi nisa and Rav Heller concludes that therefore even when lighting Barabim amongst only goyim one may make a bracha. For more sources to be matir saying a bracha see Shu"T Mishne Sachir (Orach Chaim volume 2 siman 202) he brings a shaila where they forgot to light the menorah in the beis hakneses btzibur and later after davening by the shiur they wanted to light he paskened they could light with a bracha and brings the Rivash that the ikar takana was to add to pirsumi nissa more than we have in the house and then the Mishne Sachir concludes that there's no difference between a beis hakneses and a beis hamidrash. See also Shu"T Beis Mordechai (siman 41) who is matir lighting at mesibos based on the Kol Bo that b'drech klal these mesibos include those who are not boki and they are yotzi with these hadlokos. See also Toras Hamoadim (siman 7 Os 15) and is matir the mesibos that occur in the ulamos and says b'derech pshara that it depends if they will daven marriv there because if so it's like a beis hakneses and they can make a bracha on the lighting. The Yalkut Yosef (204) brings down that by public gatherings where they daven Mincha & Maariv, one may light the menorah there also. The Piskei Teshuva (671:15) writes that there are those that permit lighting with a bracha at big gatherings in the city, since you would certainly find people that have not lit yet, and there's no greater mitzvah of pirsumei nisa than this. Wow, I really had no idea that there are solid sources for this Lubavitch minhag to light outside. Kol Hakavod, thanks to whomever posted. What are you talking about?? The first and second paragraphs you quote both involve gatherings where JEWS congregate i.e. to daven or to hold meetings. The Piskay T'shuva is refering to the possibility of being motzai people at big JEWISH gatherings who might not have hear the brochos yet or did not get a chance to light on there own etc. But not next to a xmas tree on City Hall property or Times Square, where zona's and perverts gather or people of other faiths have their displays as well! BTW why is it that no other Chasidim or Yeshivashe Rabbonim do this? Are they not just as well versed in the halachos of Parsumay Nissa? I think the answer is obvious by my above post #84 paragraph 2. I think I brought you enough that shows we have stirdy grounds to stand on. Now imagine if we were to take issue with you guys with regard to serious issues like shaving (6 lavin midoraisa!!) and many other questionable kulos that you guys rely on but judging others is not the inyan of Lubavitch, Ashreinu mah tov chelkeinu. “ What are you talking about?? The first and second paragraphs you quote both involve gatherings where JEWS congregate i.e. to daven or to hold meetings. The Piskay T'shuva is refering to the possibility of being motzai people at big JEWISH gatherings who might not have hear the brochos yet or did not get a chance to light on there own etc. There you have it folks, a misnagid in all his colors, in #86 he claimed there exists no sources for making a brocho outside of the Beis Hakneses and when we show the sources which he surely never knew existed because all he read or heard was loshon hora shiur against Lubavitch menorahs with quotes only from the osrim not from the matirim. I pity you guys who learn Torah Lkanter r'l. I mentioned already that you should show me a source that says NOT to follow YOUR Rabbonim. Well our Rabbanim say to make a bracha and B'roshom the Lubavitcher Rebbe was the one who was misaken this minhag and participated in the live satellite in 1990 where they made a bracha in the street Umi yovo achar Hamelech! You say that Moldovans are dark minded but do not bother to 'google' and find out where aned what is Moldova! You would find out about its tricky history and that Moldovans are the most hospitable and tolerant people in the world. Both the pogrom last century and the icident this week were staged by people in politics who want to provoke hatreted. If you read the news you would find out that Moldova is going through difficult times, with political crisis and deep economic crisis. In deed, many representatives of Moldovan society condemned the terrible incident and the police is investigating the priest and some others. It's easier to condemn and lable people as " dark minded animals" than to educate people about the Jewish culture. why should we not be permitted to display our devotion openly. do we not share this planet? Israel is a jewish state, yet we allow christians to march down the villa d'rosa, we allow a mosque to remain on our holliest site we show endless respect for the other faiths that we live with. how would they feel if we curtailed their celebrations in our land? “ You say that Moldovans are dark minded but do not bother to 'google' and find out where aned what is Moldova! You would find out about its tricky history and that Moldovans are the most hospitable and tolerant people in the world. Both the pogrom last century and the icident this week were staged by people in politics who want to provoke hatreted. If you read the news you would find out that Moldova is going through difficult times, with political crisis and deep economic crisis. In deed, many representatives of Moldovan society condemned the terrible incident and the police is investigating the priest and some others. this was not a politically motivated action. the church was the instigator, with its preists at the helm provoking the incident.